Conclude, based on this material, which genres, periods and individual programmes representing the past are favoured by the British audience. In addition, a list of British and international historical events was created in order to consider whether anniversaries played a significant role in determining what was broadcast and watched by a significant proportion of the UK audience, as this may suggest either that key events continue to be an important aspect in determining commissioning editors’ choice of material, or that they are no longer as important as they once were. Certainly, Bell and Gray’s work (e.g. 2013) suggested that in the period c.2004-14, historical anniversaries were important, but this was revisited in this study in order to consider if, in Britain, this is still the case. As outlined above, the data collected was drawn from the BARB.co.uk website and supplemented with use of the listings magazine Radio Times, which lists the forthcoming broadcasts of the majority of television and radio channels in the UK. BARB lists all television channels although information was not available for all channels for the week analysed, which may be because the channels have ceased to broadcast or did not broadcast that week. It was decided that because of the massive amount of broadcast material available to a British viewer, amounting to 331 channels broadcasting that week, a focus on the top 10/top 30 programmes in viewing terms (top 30 programmes were available only for a few channels, mainly those which were formerly the UK’s terrestrial channels) would give a reasonable sense of the range of broadcast material without the volume becoming completely unmanageable. = 3410 broadcasts were considered for the week. Of these 3410 broadcasts, 244 represented the past in some manner, whether as drama, documentary, film or (e.g.) antiques/material culture related programming, accounting for 7.2% of broadcast material. Of the 331 channels, 61 included some history-related broadcasts = 18.4%. Given that the 331 channels include e.g. Sports channels such as Sky Sports and ESPN, it seems unsurprising that some did not seem to broadcast any history-related material that week. In this context, 244 programmes/broadcasts representing the past in some manner are a larger proportion of the broadcast material: 56 x 10 and 5 x 30 = 710 broadcasts of which 244 forms 34.4%. It seems, therefore, that channels which do offer history related programming to their audiences tend to be met with audience interest and engagement, as has been previously noted. However, analysis of the 3410 broadcasts revealed that only the Hindenburg was commemorated in the week, on the More4 Channel. The documentary, What destroyed the Hindenburg?, which included attempts to re-enact likely situations before and during the fire, received an audience of 308,000, and was the 4th most popular programme on the channel that week. This was rather surprising given television’s usual interest in anniversaries, although it may also reflect the fact that most of the events did not have a direct impact in the UK and those that did, such as the Act of Union, occurred 310 rather than 300 or 250 years earlier – the impact of a full century in anniversary programming is more impactful for commissioning editors. Indeed, less well-known anniversaries which were marked in programming that week included a Channel 5 documentary marking the 15th anniversary of the murder of two young schoolgirls in Cambridgeshire, which reached an audience of 800,000 and ranked 17th most popular broadcast on the channel that week. This suggests that anniversaries which are not ‘round numbers’ are less likely to receive interest and certainly less likely to have new material commissioned (the Hindenburg documentary marked the 102th anniversary and was originally made by the Discovery Channel in 2013). Arguably it may also suggest dwindling interest on the past of commissioning editors in anniversaries. To consider if this is the case, further analysis was undertaken of the 244 broadcasts which did include an element of the representation of the past. The channels on which they appeared varied from the Hindi-language Zing channel, which included a programme Classic Hits, therefore identifying popular music in the past, to (otherwise) English- and occasionally Welsh-language material on a range of channels. For example, they included BBC4, known for broadcasting a good deal of ‘serious’, high culture material, as well as the Crime and Investigation Channel, which includes some crime documentaries representing unsolved murders from the past. The high proportion of broadcast material representing the USA is likely due to the re-versioning of a great deal of PBS and Discovery Channel material (see above regarding the Hindenburg documentary, for example) by a number of broadcasters, and also the inclusion of films, which were often Westerns. The channel Movies 4 Men, for example, aired several Westerns during the week, 4 of which were in their top 10 most popular broadcasts. Intriguingly, though, programming offered to a UK audience which depicted the UK was often fictionalised, suggesting at times a rather nostalgic view of the British past, albeit tinged with criminal activity. Such broadcasts were 8 of the top 10 broadcasts on the ITV Encore channel, which airs drama produced by the channel and in this week included the C18th prostitution drama Harlots and 7 episodes of Poirot, a detective series set in the 1910s-30s. Other channels such as Drama, ITV3, Yesterday, Alibi, ITV, BBC1 and BBC2 all had at least one historical drama, based in the UK, in the top 20 programmes. Programmes depicting the rest of Europe were fairly sparse; nothing marked the anniversary of the 2004 growth of the EU, and aside from films depicting continental Europe during World War II, such as the Spike channel’s airing of The Bridge at Remagen to 163,000 viewers, there were only a handful. These ranged from the BBC4 documentary Chemistry: a volatile history broadcast on Yesterday to an audience of 18,000, to a documentary Caligula on the Military History channel and PBS America’s Hitler’s Holocaust and Deadliest crash: disaster at Le Mans. Interestingly, Movies 4 Men also broadcast a number of documentaries on Germany in WWII, as did National Geographic. However, outside of Nazis and occasionally Roman, there was very little. A surprisingly large segment of the broadcasts related to programming which cannot easily be categorised and rather as outlined in fn2, offered an overview of music in a particular decade. These have still be included, however, as they do seek, albeit to a limited degree, to offer a sense of the past to their audience. They total 125 in part because, as noted above, so many programmes considered relatively recent years in music and would otherwise have been listed under ‘C21st’. However, the range of periods is instructive. Other than a few representations of the Georgian and Victorian periods (the latter often due to the broadcast of Westerns), the vast majority of material is C20th, often relating to WWII (24/90) or detective dramas (discussed earlier). Following on from this, it is important to note that around 30% of broadcast material was drama, a higher proportion than the overall audience share held by drama that week of c.16%, according to BARB figures. This suggests a tendency to make the past nostalgic and to fictionalise aspects of it, which is clearly appealing to UK audiences as such programmes appear in the channels’ top 10s. Unsurprisingly, then, in this context the assumed lack of interest for the anniversary of the broadening of the EU or the death of Bin Laden; perhaps this also reflects a post-referendum UK’s mindset of nostalgia for a past in which Britain was triumphant over crime and foreign aggressors. Whilst the number of broadcasts depicting the history of a particular region broadly correlates to the audience figures in the case of the UK, continental Europe and the US, with all three areas receiving average audiences of more than 0.5 million, it is revealing that the ‘other’ category, representing almost half of programmes aired, did not receive a similarly large proportion of the audience. This may be the result of two factors. First, the channels airing many of the programmes which offer a ‘countdown’ approach to the past, with an overview of key music from an earlier decade, for example, tend to be minority or otherwise less well-liked channels seeking a more limited audience than the BBC or ITV. The Hindi channel Zing and the music channel Magic, alongside the more history-related channels Military History, Vintage TV and Yesterday fall into this category. Whilst the most popular broadcast representing the past among these smaller channels, which also nicely serves as an example of ‘other’ geographic areas, is the Drama channel’s airing of the Australian (ABC) historical crime series, set in the 1920s, Miss Fisher’s murder mysteries which reaches an audience of 420,000, the 5th most watched broadcast on the channel that week, much more representative was the audience reached by the various broadcasts of Military History, the highest of which that week was 35,000 for Ancient Aliens or Discovery History’s Salvaging the Kursk which reached 17,000. In addition to the reach of such channels, which are often, although not always, only available through additional payment on top of the British TV licence fee, the subject matter – non-British, US or even European – seems to be of significantly less interest to British viewers. This may of course, though, also reflect a lack of courage amongst commissioning editors, who believe the British audience wish to view their ‘own’ history and not those of other people. This may lie behind the fact that in the top 30 programmes for both BBC1 and BBC2, none represented areas other than Britain and Europe (the latter was a drama series and accompanying documentary about Versailles). ITV offered the drama series The Durrells, based on the autobiography of the British naturalist Gerald Durrell, who grew up in Corfu in the 1930s, which may therefore be seen as depicting both the European and British past; in the week considered, the episode reached 4.3m viewers and ranked 15th of 30 ITV broadcasts. Channel 4 did not broadcast any ‘other’ histories, and Channel Five offered Ancient Mysteries, a series made by A&E in the 1990s and usually considering non-British nations, to an audience of c.1 million. It is also revealing to consider which periods of history garnered the highest audience figures and not merely the largest number of broadcasts. These could not always be determined reliably and so the sample size for the week was reduced to 125 programmes. Intriguingly, this suggests that the most popular period of history was the medieval, although the sample of one broadcast (the BBC2 drama Last Kingdom depicting Anglo-Saxons) is certainly not statistically significant although it was the 4th most popular broadcast on the channel that week. More robust are the figures for broadcasts depicting the modern (here taken to represent c.1750-1900) and C20th history. However, the averages of 0.4m and 0.55m per broadcast disguise the wide range of audience figures for each period. Twentieth-century history in particular included WWII but also a range of other material such as the dramas already discussed, and a similarly broad range of audience responses depending on the channel. For example, on Discovery History World War II in Colour reached an audience of 12,000, whilst the 1970s comedy Dad’s Army, which depicted the British Home Front during the same conflict, was aired on BBC to an audience of 1.3m. The averages of c.0.5m for programmes depicting the broad period 1750-2000, then, are largely unrepresentative but closer analysis of the historical events depicted does reveal that whilst not all depictions of WWII reach large audiences, it remains a mainstay of British history broadcasting and dramatized representations are certainly likely to reach a larger audience, even if the drama itself is several decades old, returning us to the point already made relating to the British audience and nostalgia. Other dramatized representations of the C20th aired in the week included Babs (BBC1), a biopic of the British comedy and soap actress Barbara Windsor (audience 5m) and Grantchester (ITV), a crime drama set in 1953 (audience 4.4m), alongside The Durrells (ITV; 4.3m). Indeed, other than the documentary Britain’s First Nuclear Bomb (BBC4) (audience 0.58m), and the celebration of the late comedian Victoria Wood Our friend Victoria (BBC1; 4.2m), no other representation of c.1750-2000 garnered an audience of more than 0.5m as Discovery History’s viewing figures, referred to already, suggest. Documentaries are still popular when aired on the mainstream channels, such as the long-running BBC series Coast which draws together history, natural history, geography and archaeology and reached 1.1m viewers in the week analysed, or Inside Versailles aired with the popular drama series (BBC2 1m) but rarely reach the audience figures of drama. The potential significance of these findings for the E-Story project is as follows. There is a significant tendency amongst commissioning editors to seek programming depicting certain periods and genres of history, most notably the UK and modern and C20th history. In many ways this is understandable; they assume, although often with little to confirm their assumption that audiences wish predominantly to watch ‘their’ history onscreen, whilst C19th and C2th history can be viewed through AV resources such as films and photographs, meaning that documentaries can use this material. This may have a positive impact on the use of similar materials in the history classroom as they are already well-known to TV audiences. However, there are at least 2 potential problems relating to this. First of all, familiarity does not equate to a capacity to know how such material should be handled in the classroom, hence the need to guide those training to be teachers. In Britain this is already being undertaken though postgraduate teacher training courses and of course was also undertaken by those attending the Logrono event. Secondly, there is a problem relating to the audience itself. It is well-known amongst British media professionals that ‘unicorns’, the much sought-after under-25s audience, are extremely difficult to reach and it may well be that this group is disproportionately under-represented in the figures discussed in this report. This is a problem beyond the scope of the project to resolve; perhaps it is sufficient to conclude that history teachers are likely to be watching history documentaries and perhaps using them in the classroom, and in this sense televised representations of the past are having an impact on the secondary classroom. Comparison of online with televised material, where possible. As for television, the key historical events of the week were searched for online, although again, there was surprisingly little apparent interest in them by British users. Even the More4 documentary on the Hindenburg was not commented upon on the DigitalSpy website, on which viewers make comments about television and, more recently, other media. Digitalspy has previously proved a useful resource for garnering viewer responses to broadcast media so the lack of responses was surprising but may point to the relative lack of impact of anniversaries to programming in the week studied. Comments on Twitter proved slightly more fruitful although again, many of the anniversaries were not noted. The death of Osama bin Laden was certainly noted, with a range of responses ranging from celebration to resentment depending on their originator, but it proved very difficult, if not impossible, to determine which were British; it could only be concluded with certainty that English-language responses would be accessible to people in the UK. 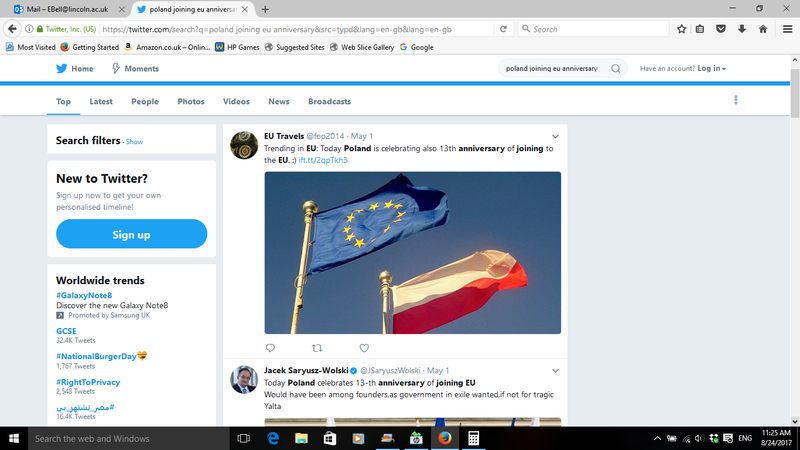 The expansion of the EU in 2004 was marked by a number of the countries involved and also be independent groups such as the travel agent EU Travels which noted Poland’s anniversary although there was otherwise relatively little Twitter activity on the EU anniversary. 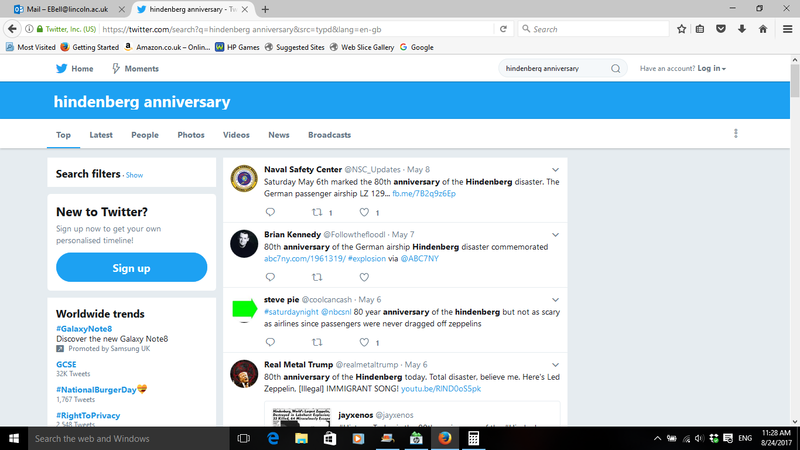 The Hindenburg anniversary had a number of tweets including the US Naval Safety Centre; again, these would be accessible to UK readers but specifically UK responses could not be discerned. 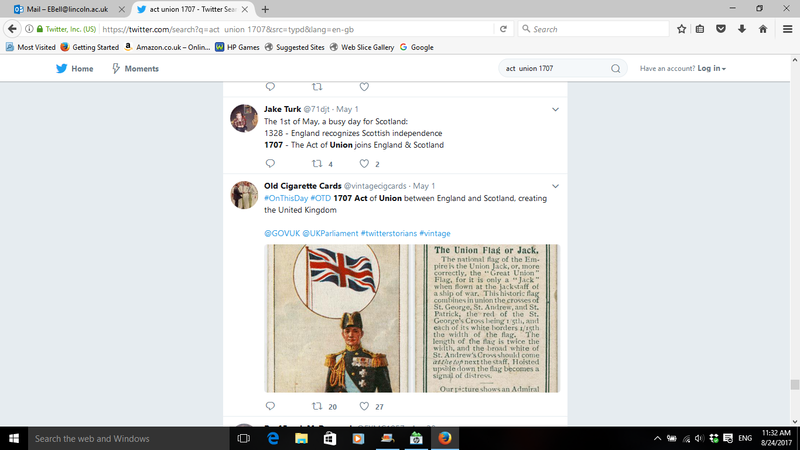 Several British authors were apparent in tweets relating to the anniversary of the 1707 Act of Union between England and Scotland, although the overall number was not significant and it seems likely that some writers came from other nations. Finally, the torpedoing of the Lusitania was by far the most commented-upon event, with a large number of US and other Anglophone authors including the far-right British National Party although it is unclear why they felt moved to contribute, other than to mark an event which occurred during a conflict in which there was British involvement. 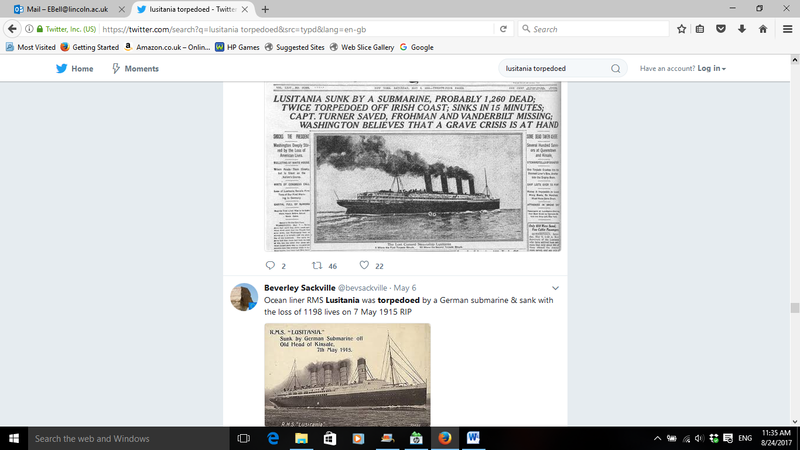 Samples of tweets are included in the appendix to this report and those specifically relating to the Lusitania are also collated on the Lusitania resource website here: see www.rmslusitania.info under ‘recent posts’. Facebook groups were considered in the previous report and given the lack of responses to key anniversaries (other than by EU Travels) it is hardly surprising that there should be little FB activity among British readers. The Lusitania was marked, though, by groups representing descendants of victims and history groups, and an array of visual material such as photographs, advertisements and paintings was uploaded around the time of the anniversary of its sinking, although for members of the FB group this is an ongoing activity: see www.facebook.com/rmslusitania. Respondents seem to be based across the globe which is unsurprising given the diverse range of nationalities on-board. As for FB and Twitter, there is very little way of knowing the nationality of those responding to newspaper articles online unless the author specifically states their origin or it is apparent through their username. In the case of the tabloid Daily Mail, it is possible to state that almost 1.5m copies are produced in print, with almost 15m unique browsers to the newspaper’s website (see http://www.newsworks.org.uk/Daily-Mail ), but only the former figure will definitely apply to, predominantly, British readers. Returning to online content, the Daily Mail website did, for example, mark the Hindenburg fire by republishing its original coverage of the disaster in 1937 (Associated Press 2017), although there were no reader comments on the article. Other anniversaries were not marked although during the week analysed, several pieces were published relating to WWII, including an article on the German occupation of the Channel Islands first published online on 7 May, which noted the abuses of prisoners-of-war from elsewhere in Europe, and concentration camp inmates taken there from the continent to work as slave labourers. (Kemp and Weigold 2017) The article received 10 responses, which are intriguing in their different ways. Most (8 of the 10) were from British authors. The first asserted that he ‘didn’t believe a word of it’; presumably that the atrocities have been relatively little recognised. In the aftermath of the referendum, the second response is almost predictable: ‘The first picture [of German troops in the streets of Alderney] could be updated by replacing it with a picture of Merkel and her cronies standing outside of the European Parliament building in Brussels.’ Another similarly joked that ‘…Initially, I did think that the group photograph was of the new German members of the EU.’ Another noted how British far right parties often idolise such individuals: ‘And yet, these are the people USKIP, BNP and Britain First idolise and indeed at most of their rallies, they do the fascist salute- strange world these holocaust denials.’ The responses highlight the anti-EU tendencies of the Mail as a whole (albeit only through a sample of two) as well as a general repugnance for Nazi activities during WWII and should be considered as part of the interpretation of the past being attempted online in a way which is accessible to a wide range of users, including students at school. 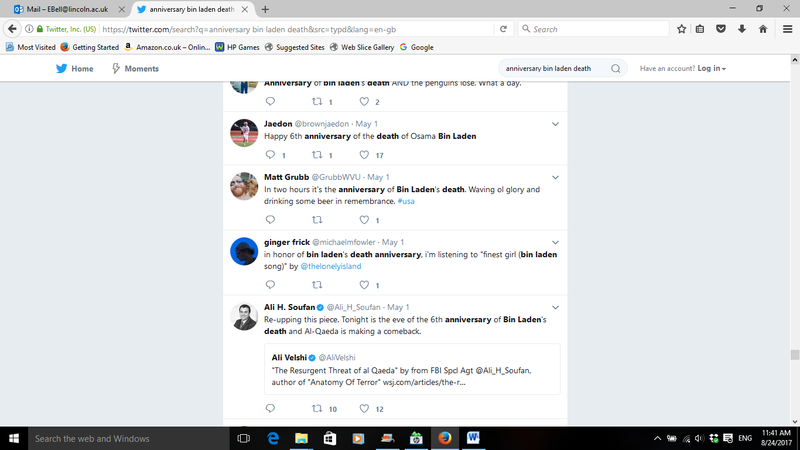 In the week analysed, the Guardian’s response to historical events included a lengthy article on Osama bin Laden’s wives published on 6 May 2017 (Scott-Clark and Levy 2017) which received no comments, as did an article the following day marking the 80th anniversary of the Hindenburg disaster (Walters 2017). The lack of responses compared to the Mail is difficult to analyse but certainly, via newspaper as well as other websites interpretations of the relatively recent past were being offered to readers in the week considered. Certainly, not all online material available to UK readers is equal. Much originates outside the UK; other material is difficult to identify as English is spoken commonly across the globe. Furthermore, there is clearly a difference between material available online for researchers through websites such as rmslusitania.info, and the musings of a respondent to an online newspaper article. Certainly, though, the internet makes good use of visual resources, as both the Guardian and Mail articles on the Hindenburg disaster evidence. It may well be that access to such material, alongside the fact that it was a ‘significant’ anniversary (the 80th), with one survivor still alive in the US to offer his thoughts on the tragedy, that rather more was made of the event than of, for example, the 310th anniversary of the Act of Union. This suggests a similar set of priorities to those of commissioning editors, and may work in the favour of history teachers as they may provide access to and help in identifying images and film of key events, useful in the classroom. Online and televisual representations and discussions of the past shared several common traits in the first week of May 2017. Whilst it is rather easier to identify what was accessible to a British audience, and garner a sense of its popularity through audience figures, it has been possible to a degree to gain a sense of which events were perceived as important to a British web-user, and to consider what they share in common with the periods and places of history depicted on television. Most notably, both television broadcasts and online material tended to focus on C19th and especially C20th history – not only, but including, WWII and events of the same era such as the Hindenburg disaster. This is unsurprising since a large proportion of history programming on UK (and other) television is similar weighted towards events for which eyewitness testimony, film or photographs are available. Websites too seek AV material and therefore a similar weighting may be found, for example in online press reports also on the Hindenburg. It is also the case that British history, followed by US and then European history – the latter largely but not entirely in relation to WWII – was the most popular on television, whilst online material certainly favours national history and international history where the UK has been involved. Where this was not the case, such as for the Hindenburg, the significance of the event at the time, to an Anglophone British ally, alongside a major anniversary on which a survivor could comment, led 2 very different newspaper websites to run articles in the week studied. Online representations of the past differ most significantly from television, though, because responses of readers cannot be controlled and, as comments on the Mail’s article about the occupation of Alderney reveal, may offer an opportunity for anti-EU (one might add, anti-mainland-Europe) individuals to shape events of the past to fit their view of the present. This, of course, poses a problem for other readers, which goes beyond the issues of accuracy or misuse of images posed by some history documentaries. Instead, the very freedom of the internet, which may be used to the benefit of students if, for example, a website listing useful and accessible resources is drawn together via the E-Story project and Euroclio, can also offer a podium for extremists whose views can reach and influence those learning and teaching history. As this report has outlined, a huge number of televised broadcasts referring to the past in some manner were offered to UK viewers in the first week of May 2017. Although the precise length of all of the programming is not available, an estimate suggests that at least 244 hours of history-related programming (an estimate that draws on the different length of broadcast, between 30 minutes for some children’s history programming such as the CBBC (Children’s BBC) series Horrible Histories to much longer broadcasts, for example the film Zulu on Sky Cinema Modern Greats, lasting 139 minutes) was broadcast that week. However, it also must be noted that although such programming is also often available online, the websites considered in the second part of this analysis are necessarily available 24/7 and in the main to anyone with an internet connection, demonstrating both the positive potential of the internet for dissemination of AV material and training for its use, but also the less helpful comments of readers who certainly have a right to share their ideas but may on occasion take advantage of the opportunity to express opinions unhelpful (at best) to those seeking information about the past. That the pasts depicted in the UK at least, to be national in tone is probably not unusual, and neither is the tendency towards more recent history, although as the late Raphael Samuel noted, the appearance of historical individuals in photographs and, we might add, films can give a misleading impression that they shared other aspects of our modern mindset. This is especially crucial in a period of national political and economic upheaval post-referendum and pre-Brexit, making it the task of teachers and students of history of recognise this, even when, for example, readers of newspaper articles offered online apparently do not fully appreciate it. Including broadcasts which represent a number of nations, e.g. the Sky Cinema airing of The Great Escape to an audience of 20,000. This represents other geographical areas or a mix of areas, such as some programming relating to World War II, but also programmes where it was impossible to specifically identify an area, e.g. the Magic channel’s various ‘Hits of the 90s’-type listings of popular culture of a specific decade and generically in the West. 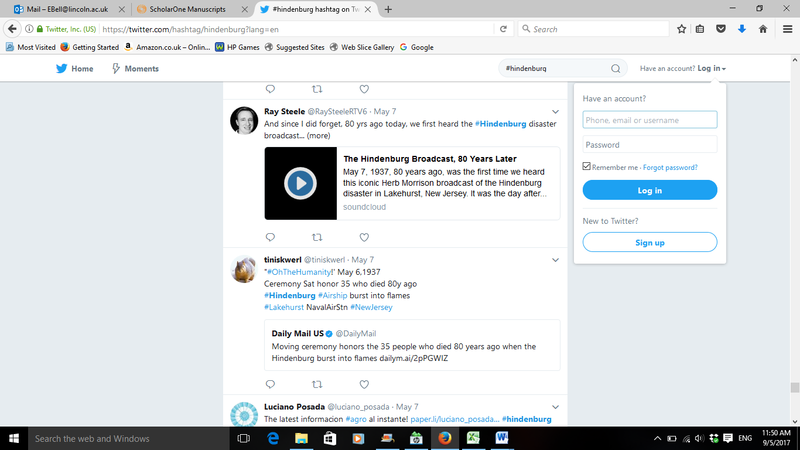 Screenshots of Twitter pages relating to anniversaries, first week of May 2017, as discussed in report. 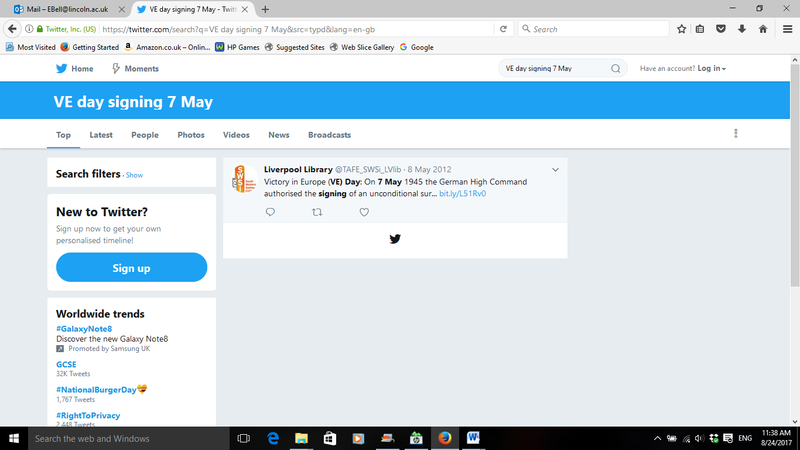 German surrender, May 1945 – note that this is the only comment from a UK source on Twitter, and nothing was added marking the date (7 May) in 2017.